Lanner is demonstrating its compact, fanless embedded PC’s LEC-2580P, with integrated pluggable Intel Movidius accelerator engine, to create a reliable hardware platform for developers to deploy a robust deep learning vision solution for intelligent surveillance, traffic management, access control, retail and beyond. 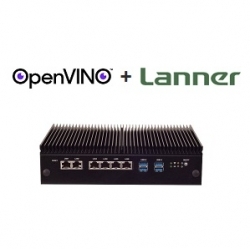 Toronto, Canada, April 09, 2019 --(PR.com)-- Lanner Electronics Inc., a global leader in developing network appliances and intelligent network video recorders, has leveraged its longstanding partnership with Intel, who is leading embedded deep learning with their OpenVINO toolkit and Myriad X VPU’s, to offer modular, low-power and cost-effective edge vision processing. Lanner’s modular approach to network appliances provides a clear path for engineers looking to optimize their neural processing workloads using Intel’s Vision Processing Units integrated through standard mini-PCIe expansion slots. This form-factor improves hardware-software integration and resilience in rugged, embedded and mobile applications where protruding dongles are less than ideal. Lanner Electronics Inc is a world leading provider of design, engineering and manufacturing services for purpose-built advanced network appliances and rugged applied computing platforms for OEMs, system integrators, service providers and application developers. For more information, please visit www.lanner-america.com or follow us on Twitter at @LannerAmerica .